I'm sure many of you wonder what I do, professionally speaking, besides entertain the blogosphere with amazingly awesome outfit posts. (Just indulge my delusional self and nod your head yes, please.) Well dearies, here in Nevada we rough the desert hills, mining for silver and tending to the fields. Leather-skinned outlaws roam and torment good folk, while the constant threat of isolation can drive a man crazy. CRAZY. Ah hell, but everyone really knows gambling and prostitution run this state. And me? I work 9-5. Yep, a 9-5 prostitute. Now you can say you've met one. Just kidding. I'm working as a paralegal right now, killing time before I find the perfect way to word my pitch letter to Anna Wintour, making her realize that there is no possible way she cannot have me write for her publication. Yeah, I know. The prostitution bit was probably more exciting. And, as I'm sure I just lost 10 readers because of that statement, probably more believable, huh? oh i love this. you look fab! That dress is wonderful! 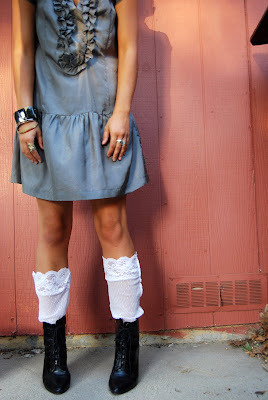 I love the ruffle detail, and it looks so great paired with the lace socks and harder edgier boots. You look awesome! I love the ruffle in the dress very beautiful- and I think your post was funny! haha 9-5 prostitute! HAhaha, a prostitute would be more exciting, but we can't all be so glamorous, can we? Love those boots, though. wow i am not even kidding you your style is AMAZING !!! And hahaha what a classy, well-dressed prostitute (; Do send that letter! Send that fabulous pitch that will make Anna Wintour crawl to you and beg you to join the Voguettes! I love this entire look but the shoes especially. I tagged you on my page! GREAT dress!!! I love it!! 5 dolla make you holla! you're going to watch that documentary that's coming out about anna wintour with me, right? Adorable! 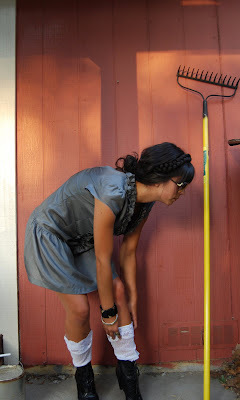 So I see this picture and what pops into my head... Those little girls who used to play dress up and wear adorable dresses for their daily backyard, dirt playing or in this case with a rake. Damn I wish I had a back yard! I have a few dresses that could use some good dirty fun!! Oh well I guess jumping in puddles will do for now.